Feline - Saddle Thrombosis - Aortic thromboembolism, Fibrocartilaginous Embolism (FCE) in Dogs. Blood clot, vascular. Embolism Lung - PREVENT or SOLUTION - for all species. Use as a prevention or treatment of blot clots. Symptoms, unable to move rear legs. Cats with Hyper-thyroidism are prone. Fast acting treatment aortic thromboembolism. Cats with "heart conditions" may develop vascular deficiencies that could cause "aortic thromboembolism" or "saddle thrombus." Aortic thromboembolism is a blood clot that generally forms in the heart and then moves down the large artery (aorta) that provides blood to the abdomen and hind legs of the cat. By applying the homeopathic formula Thrombosis 295 drops, applied every 10 - 15 minutes for 4 repeats, will work quickly to relieve acute pain, then continue to heal the symptom with repeat dosing throughout the day. While your pet is healing, repeat frequent dosing whenever needed if discomfort is seen. This formula will also prevent thrombosis - blot clots. The largest artery in the body that is the main “highway” for the propagation of oxygenated blood from the heart to the tissues is the aorta. The feline aorta leaves the heart with oxygen-rich blood and courses through the chest and ultimately through the abdomen heading toward the tail. At the level of the pelvis, the aorta splits into two smaller arteries that ultimately supply blood to the tissues of each leg. 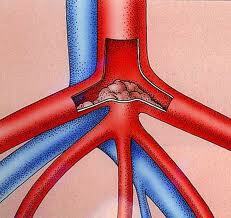 It is at this split were formed clots can get lodged, leading to a severe medical emergency called a saddle thrombus. Saddle thrombus is exclusively a feline phenomenon, causing a severe situation where the lodged clot cuts off blood supply to the legs. The lack of nutrient-rich, oxygen-rich blood reaching the tissues of the legs leads to severe pain, disuse of the legs and severe damage to the tissues, blood vessels, and nerves. Typically, cats that are predisposed to saddle thrombus have an underlying cardiac (heart) disease that increases turbulence to the flow of blood through the heart. This increased turbulence makes these patients more prone to the formation of clots. Most FCE dogs are young adults between the ages of 3 and 6 years. In one study, 61% were evaluated after some kind exercise injury or trauma. There may be a yelp at the time of the trauma but the injury is generally not painful. There is about a 50:50 chance that the lumbar area of the spinal cord will be affected, which means only the rear legs will be involved. Because the embolism is not generally a symmetrical event, both left and right may not be equally affected. Will my Dog be Okay? This depends on how much loss of function there is, and if you start using homeopathic treatments now, less damage and improvement is seen quite quickly. The homeopathic will also help prevent further issues. In general, the loss of function will not get worse; after the first 24 hours, the maximum function loss has occurred. Your dog may or may not be able to improve if in the care with conventional drugs (about 74% of dogs in one study showed some improvement ultimately) but be prepared for no improvement and ask yourself what kind of care will be needed and can your dog get around. Maximum improvement has generally occurred by 3 weeks after the time of the injury, with some dogs showing some additional slow improvement over months. Many dogs are completely paralyzed. Many dogs are simply weak in the affected limbs. They may or may not need assistance in getting around. It all depends on how severe the embolism was and wherein the spinal cord it occurred. Other remedies are also indicated if your dog is in this situation. Please contact our Practitioners. We have seen a dog with this condition after using Nexgard (flea and tick drug) as its a neurotoxin that affects the nervous system and brain. If your pet has also got a heart condition - i.e. congestive heart failure, cardiomyopathy, arrhythmias, tachycardia, hypertrophic, cardiomegaly, bradycardia, AF, feline hypertrophic cardiomyopathy. Also, look at using the HAMPL Congestive Heart 22-1 drops. In this Heart Support Set of 3, we have also included the HAMPL DuraAid 22-3 drops which are a natural diuretic. If you don't need the natural diuretic or herbal heart tonic, let us know when checking out online. You can use in conjunction with chemical heart drugs, however, you will see a difference in health and energy when using an alternative to the drugs. are prone to a cardiac condition called hypertrophic cardiomyopathy. Therefore, saddle thrombus tends to be associated with cats that have hyperthyroidism. Contains homeopathic, nosode complex: Kali Mur 4C (embolism), Ferr Phos 6X, Ammon.Causticum 6C,1M, Bothrops Venom 4C, 6X (thrombosis, embolism-blood clot, lung congestion), Phosphorus 12X, 10M (polycythemia, eye disorder, hemorrhages, hemophilia, headache, vaccinosis) Arnica 3X, 4C, 30C,10M (bleeding, bruising) HAMPL Pain Eze 32 formula. PREVENTION add a couple of drops in meals or water dish once a day to three times a week. SYMPTOMS of possible prognosis or diagnosis condition - for fast relief, continue to repeat dosing until relief of symptoms and preventing further damages. Reduce frequencies to casual dosing 3 x daily until all clear, then go to prevention dosing. if your pet has a heart condition, also look at the HAMPL Congestive Heart 22-1 drops. In this Heart Support Set, we have also included the HAMPL DuraAid 22-3 drops which are a natural diuretic. If you don't need the natural diuretic let us know when checking out online. You can use in conjunction with chemical heart drugs, however, you will see a difference in health and energy when using an alternative to the drugs. Regurgitation (endocardiosis), insufficiency or Incompetence, heart murmur, irregular pulse (cardiac arrhythmia).